No need to bother about joint pain …! If the bones are fractured due to accident or if the bones develop hairline fractures for some reason, the fractured area was treated with a bandage called ‘Maavukattu’ in those days. If the bandage is very tight, then, there’s the risk of the bones bending. And, the patient was required to remain immobile until the time the fractured bones were set right. But today, modern treatment methods are in practice. Constructive surgery, surgery for hands, soles, joints, back etc. are available. Those who undergo the surgery is not required to stay in the bed continuously, they can have their normal routine to some extent. And, they are discharged in just two or three days after the surgery. Though it will take three months for the fracture to heal, the patient can return to his normal life very soon. So, joint wear-out is not a big problem today. Transplantation of the joints is being done very commonly and the patient will be free from the problem till end after the surgery. Key-hole surgery method is adopted in the case of broken bones. A hole is made at the joint and sutures are made through this hole at the site of the damaged tissues. Hairline fractures are also treated very easily. Wearing out of the backbone is also becoming a common problem nowadays. 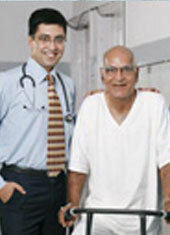 If a person feels pain due to some problem in the bone, he should consult the doctor immediately. If there’s problem at the tail end of the spinal cord, the person will feel pain whenever he tries to sit. This problem can also be rectified by surgery. The incidence of this problem is very high in our country because of genetic factor. But as solutions are available for all types of bone problems today, there’s no need to panic. “Do exercise regularly and eat good nutritious food, you can bid goodbye to joint pain!” says Dr. Vijay C. Bose. When we get pain at the joints, we massage eucalyptus oil on the area and get temporary relief. But today, medicine has advanced to a great extent and drugs have been discovered to deal with this problem on a permanent basis. Regular exercise and nutritious food would prevent wearing out of the bones to a great extent. Calcium rich foods like green vegetables and milk should be included in our diet without fail. Growing children and women should take two cups of milk daily.